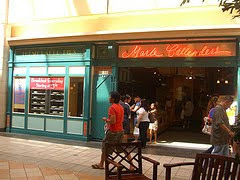 Has Marie Callender's been open since the Town Center opened? It seems that they've been around forever but I always forget that it's there since it's part of the mall. I called and looked online to compare their Thanksgiving pie prices to Polly's Pies and this is what I found. Orders can be taken in person, over the phone, or online. When reserving in person or by phone no payment is required. Online orders require payment. Marie's has over 25 pies on it's menu with prices ranging from $11.49 to $15.99, cheesecakes are $35.99. There is an 80 cent refundable charge for the pie tin. Pie Pick-Up hours on Thanksgiving day are 6am-11am. Pies can be purchased on a walk-in basis on Thanksgiving morning but all pies are not guaranteed. Tip: Order the pies in person and purchase a $25 Marie Callender's gift card and get a $5 card free to use in January. When you pick up your pies use the $25 gift card for payment.